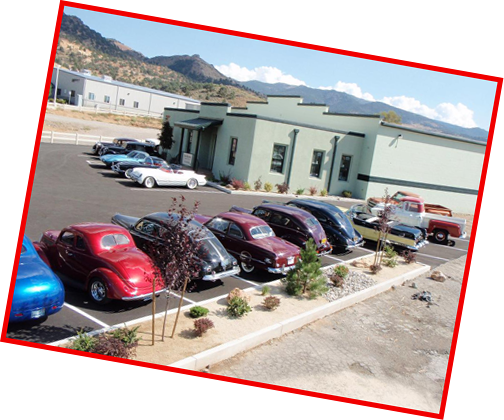 National Sierra Motorcars is an ASE certified auto repair and restoration shop located at 1595 Geiger Grade Road (bottom of Virginia City Highway 341) telephone # 775-853-2478. We repair and service all vehicles, but specialize in classic and unique motorcars. In addition to the traditional auto repair equipment and capabilities, we have on-site welding, milling and metal fabrication. Call for a tour of our shop or visit our webpage www.nationalsierramotorcars.com to view our collection of representative autos. Take exit 57B (S. Virginia Street ~ Virginia City/Carson City/So. Lake Tahoe). Turn left onto Geiger Grade Road (NV-341 East). At the roundabout, continue straight onto Geiger Grade Road. Turn right onto Geiger Grade Road (NV-341 East).